The greatest Alfa engine, the Busso V6 is long since out of production, a dinosaur from a different era, its glorious tune consigned to the history books effectively outlawed by bureaucracy. Now it is all about the latest emissions standards, today we are on Euro 6 which came into force in September 2014 and will most likely be the standard for the next 4 years or so, these standards equate with the C.F. numbers that Alfa use. There are however far more insidious sets of regulations in place; in the USA there is the Corporate Average Fuel Economy (CAFE) regulations which basically states that all manufacturers have to achieve a certain average MPG over all the vehicles they produce, so by 2025 the average small car in the Fiat group range will have to go from 36 mpg to 60 mpg which is quite a change in 11 years! To give you some idea of how bad a 3.2 V6 is its average MPG of 23.3 falls far short of even todays standard in the USA and in the UK we have the VED, and no that isn’t an STD although paying it for a 3.2l V6 is probably more painful, its the Vehicle Excise Duty which is £500 a year on the Busso V6. Quite simply people are insisting on buying far more efficient vehicles and very few of us are immune from this in these constrained economic times. In the future petrol heads are going to have to move towards cars like the Alfa 4C in order to get their speed fix. One of the major factors in fuel economy is weight and one of the heaviest parts of a car is its engine so, as you may have noticed, engines are getting smaller and more powerful. This is in large part due to turbochargers and their technology is advancing at an extremely fast rate. Turbo charging is one of two basic ways of getting more air into an engine by increasing its pressure (forced induction) the other being supercharging. The difference between the two is that supercharging uses the power of the engine to pressurise the gas coming into the engine while turbo charging uses mainly the heat energy from the waste exhaust gases to compress the incoming charge and so is much more fuel efficient. It is turbo charging that is used on most modern Alfa’s. 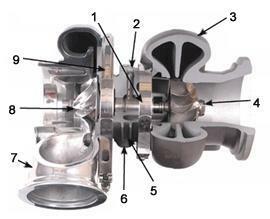 Today there are two basic differences between the turbochargers used on petrol and diesel engines, Diesel engines use variable vane technology to regulate the pressure of the intake charge while a petrol engine will nearly always use a wastegate due to the higher temperatures of the exhaust gas although I suspect that this will change in time due to the inherent efficiencies of the variable vane turbocharger. OK so what am I talking about? Well a wastegate is basically a flap that opens up and ducts the exhaust gas through a separate pipe which bypasses the turbine completely. While a variable vane turbocharger ducts all the gas past the turbine but makes the turbine more or less efficient by increasing or decreasing the gap between the turbine and its outer casing; the less the gap the more power is extracted from the exhaust gases to compress the inlet charge. A turbo consists of essentially 3 parts, a compressor, a bearing housing and a turbine; the compressor is of an axial-inflow radial out-flow design, i.e. air is sucked in along the shaft and then flung outwards at right angles to the shaft. Having the smallest possible gap between the compressor wheel and the housing is crucially important to the efficiency of the turbocharger. Originally the impellers were mass produced using a special casting process but nowadays they are increasingly milled from an aluminum forging alloy, the impeller will then be coated to provide protection against the exhaust gas that is recirculated to reduce the emissions, also on the compression side of the turbocharger there is a blow off valve. Essentially in order to stop the compressor stalling when the throttle is closed quickly a electrically operated relief valve opens and the excess pressure in the inlet manifold is bled back into the intake to the turbocharger. The maximum possible amount of air that can be drawn through the turbocharger is limited by the air reaching the speed of sound through the narrowest cross section. With a petrol engine the flow range of the turbo compressor has to be considerably wider than for a diesel engine as it has to operate behind the throttle butterfly which restricts the amount of air that can reach the engine at idle. From the comparatively benign atmosphere of the compressor stage of the turbocharger we move to the bearing housing. Here life is a lot harder, firstly the bearings have to be able to spin at up to 300,000 rpm reliably for 100,000 miles (approx 1,000,000,000 revolutions). Next the bearings need to be lubricated without them leaking into either the compressor or the turbine and then there is the temperature gradient of the turbine shaft with the exhaust turbine running at between 820-1050°C while the compressor is at around 100°C; now that is a design feat in a shaft 10cm long! The bearings in a turbocharger are specially developed and are a plain bearing (like a crankshaft bearing) which acts both radially and axially. Oil is supplied to the turbocharger from the engines main oil supply and the oil drains straight back into the sump, this oil is usually used to cool the turbocharger as well but in high performance applications the turbo may also have a coolant supply to it from the engine. In the 4C the oil is also circulated through the turbo by an electric pump in order to provide cooling after the engine has been shut down, this helps to prevent the oil from oxidising in the turbo. Turbocharger manufacturers are working on reducing the time a turbo takes to spool up and one of the areas they are looking at are the bearings, in the near future we may well have roller bearings which will have the added benefit of reducing fuel consumption, research is also underway into air and magnetic bearings. The part of the turbo that gets it hardest of all is the turbine. This has to be able to work from cold to over 1000°C and it has to be able to get there in under a minute. On Alfa engines the turbine is a smaller version of the compressor turbine, but the gas goes the other way through it, i.e. the exhaust gas comes in radially and exits axially along the line of the shaft. The exhaust can be arranged to feed into it in two different ways depending on how you want the turbine to react; you can either use pulse turbo charging or constant pressure turbo charging and broadly speaking as far as we are concerned Alfa generally use pulse turbo charging for petrol engines and constant pressure turbo charging on Diesels. With pulse turbo charging the exhaust gas for each cylinder is kept separate for as long as possible before it is fed into the turbine, so that the exhaust gas enters the turbo as separate individual pulses from each cylinder. This speeds up the response of the turbo at low speeds and improves the turbos accelerating performance. Constant pressure turbo charging has more uniform pressures and the exhaust gas can be processed more efficiently giving significant fuel economy gains. The manifolds on constant pressure turbochargers tend to have a larger volume collector but will often have a smaller overall dimension as the exhaust manifold lengths are not as accurately matched. The turbine housing on later Alfa’s with constant pressure turbo charging are even integrated into the exhaust manifold. To withstand the high temperatures and high loads, turbine wheels are made of steel with very high levels of nickel. The rotor is cast using the lost wax process for accuracy and then the turbine is attached to the shaft by electron beam or laser welding, on older cars though it may just be an interference fit. In due course the turbine may well be made of Titanium Aluminide which due to its low density reduces the mass of the turbine significantly thus reducing the time that the turbo takes to spool up but this may take a while as the material is extremely difficult to work with. So there you have it we are getting more efficient by using the heat that is wasted down the exhaust pipe to effectively increase the capacity of the engine, thus reducing the weight per bhp that the engine produces. The question now becomes how much further can the reciprocating piston engine go or will it become a museum piece like the steam engine. As I see it there is a number of options long term but I don’t know which one will win out; electric vehicles take a long time to charge but you could have replaceable battery packs but then are you just moving the source of the pollution from the car to the power station. Hydrogen cars have more safety issues than petrol engines and again the hydrogen is produced using electricity so are we again just moving the source of pollution. Could turbines take over completely or do we all have to get back on our bikes?